The Metropolitan Evansville Transit System is preparing to implement new bus fares, Sunday bus service and expanded night service on select routes effective January 2. The changes were recommended as part of the METS Comprehensive Operational Analysis conducted in 2015. Bus fares for all passengers will decrease and bus transfers will be eliminated. Adult fares will change from $1 to $0.75 per ride, student fares will change from 75 cents to 50 cents per ride, elderly and disabled fares will change from 50 cents to 35 cents per ride, and Mobility fares will change from $2 to $1.50 per ride. Sunday bus service will be available on five routes from 6:00 a.m. to 6:00 p.m. starting January 8. The Sunday routes are Howell/Mary, First Avenue, Lincoln Avenue, Covert Avenue, and East Connection. Expanded night service will be available on the Lynch/Walnut route Monday through Saturday from 6:15 p.m. to 12:15 a.m. The Mary A Route will be combined with the Howell Route to create the new Howell/Mary Route and allow for restructuring of additional bus routes. To accommodate the new routes, A buses on the Lincoln, Riverside, Covert, and Washington routes will not run between 10:45 a.m. and 12:45 a.m. each day. METS riders are encouraged to use the new DoubleMap bus tracking system, which allows riders to use smartphones to track the exact location of any bus in real time. Riders with questions about the new bus service, rate structure or DoubleMap tracking system should call METS at 812-435-6166. For TDD/Hearing Impaired, please use Relay Indiana 1-800-743-3333. Information is also available online at www.evansville.in.gov/mets. UPS drop boxes have arrived! Outside of the UE Bookstore delivery door to the left of the service lane. Overall dimensions of an outside UPS drop box is 55”H x 25”W x 22”D. The box that holds shipment ready parcels is 20” x 20” x 18”. The drop box scheduled pick up time is likely to be 6:00 p.m. and the pick-up time will be posted by UPS on the exterior of each drop box. UE and UPS are not responsible for parcels left OUTSIDE of a drop box at any time. UPS will attempt to contact senders directly, if parcels are placed in the drop box that are not shipment ready. Senders are responsible for preparing their parcels for shipment including appropriately taping, addressing parcels, attaching shipping labels and/or documentation, as appropriate. Pre-paid return labeled parcels too large for a campus drop box with no return date/time sensitivity may be taken to the UE Bookstore. The UE Bookstore does not have daily UPS pickup. Senders who have pre-paid return labeled parcels too large for a campus drop box that are date/time sensitive may call UPS 1-800-PICK-UPS for a site pickup or take the parcel to an alternate local UPS drop-off site (Office Depot, The UPS Store, etc.) or directly to UPS. For additional information, visit the Mail Services website on AceLink. For questions, contact administrative services at 812-488-2940. The Department of Computer Science and Electrical Engineering is the winner of the inaugural 2016 Koch Holiday Door Competition. 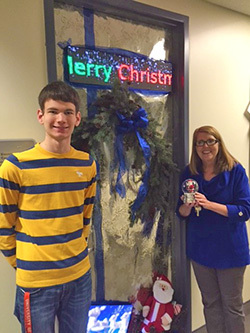 Several departments housed in Koch Center for Engineering and Science festively decorated their doors for the contest. Robert Baines, assistant professor of English, published an article in the most recent edition of the Dublin James Joyce Journal. This edition of the journal was a special edition devoted entirely to Joyce's last novel, Finnegans Wake. Baines's article was titled "Time and Space: The Opposition of Professor Jones in Finnegans Wake I.6." Fresh off of a perfect 5-0 home stand, the University of Evansville Men’s Basketball team heads south to take on Austin Peay on Saturday evening at 7:00 p.m. The Ohio Valley Conference Digital Network will have the broadcast while you can listen live at 91.5 WUEV or www.WUEV.org. Ryan Taylor and Jaylon Brown combined to score 56 of the Aces’ 85 points in an 85-66 win over Norfolk State on Wednesday. Taylor drained 13 shots on his way to a career-best 38 points while Brown finished with 18. The Aces owned the boards against the Spartans, finishing with their top rebounding advantage of the year (38-24). Nine rebounds by Christian Benzon moved him into the team lead with 4.9 per game. UE has one more non-conference home game left as they face Mount St. Joseph on Thursday, December 22. Taylor scored 16 points in the first 8 minutes of play in route to a career-best 38 tallies against Norfolk State. He connected on 13 of his 21 attempts and was 6/10 from outside in the contest. The game marked his sixth double digit effort in the last seven games and pushed his season average up to 16.9 points per game, ranking fourth in the MVC. For the first time since the 2001-02 campaign, UE has had two players record 30 or more points. Jaylon Brown had 39 against Toledo while Ryan Taylor scored 38 versus Norfolk State; the last duo to do so was Dan Lytle and Tobias Brinkley. Lytle scored 31 on December 22, 2001, against Green Bay while Brinkley notched 30 in a game versus Wichita State on February 23, 2002. It is the first time the Aces have had two 38-point efforts in the same season since 2011-12 when Colt Ryan had 43 against Creighton and 39 in a win over Bradley. The last time two different players registered 38 points or more came in 1988-89 when Dan Godfread scored 43 at Loyola (February 25, 1989) just seven days after Scott Haffner’s record-breaking effort of 65 against Dayton, which took place on February 18, 1989. Earning more playing time as a senior, Christian Benzon has taken full advantage of the opportunity. Benzon leads the Aces with 4.9 rebounds per game and has also notched 4.5 points while seeing 22.2 minutes of work per game. In the win over Norfolk State, Benzon hauled in a career-high nine boards to move into the team lead. Austin Peay comes into Saturday’s game with a 4-6 record following a 96-77 loss at Wofford on Thursday night. The Governors have fallen in their last four contests, a tough stretch that included a home-and-home at Fort Wayne and trips to Arkansas and Wofford. Jose Robinson is the top scorer for APSU, checking in at 20.4 points per game. Robinson poured in 28 points last time out versus the Terriers. Behind him is Kenny Jones, who checks in with 14.7 PPG. Student-athletes from various University of Evansville sports programs have been spreading holiday cheer in the local community with several community service projects over the last few weeks. During the Community Outreach Day for Men’s and Women’s Basketball on December 3, members of the baseball team dressed as Purple Santa, the Gingerbread Man, Buddy the Elf, and Ace Purple as they put smiles on the faces of more than 4,000 elementary school age children. The next day, women’s Tennis, Women’s Soccer, Softball, Baseball, Men’s Soccer, and Men’s Basketball were back out at local elementary schools. The group visited St. Benedict Cathedral School, Vogel Elementary, Lodge Elementary, Hebron Elementary, and the Community Action Program of Evansville (CAPE) to read Christmas stories and hand out candy canes and Ace Purple coloring pages to the children. They promoted the Just Read! Program, which was developed in order to teach kids the importance of reading at an early age while utilizing student-athletes as positive role models. Players from six UE programs all took time out of their Reading/Study Day to participate in the holiday hospitality. “It was a great change of pace for us as far as students having the kind of charge schedule that we do have. The better part was to see the effect that it has on the kids, they enjoying themselves, getting to learn from a different perspective from us (students-athlete), who are learning as well,” Men’s Soccer player Arlick Ntabana said. “That was the best part more than anything else. We’ve been there (at that age), they get to see where we are now, what they can aspire to be. Whether it’s a student-athlete, or students to further themselves, they get to interact with people other than their teachers or peers, and it’s great from a social and academic aspect. " The student athletes were dressed in Santa hats as well as elf and gingerbread costumes. Purple Santa, and Ace Purple were also both on hand to make the children smile. Aces student-athletes also participated in the Toys for Tots program. They purchased over $900 worth of toys and delivered them to the Old National Bank branch at Weinbach and Lincoln Avenues, which is a collection site for Toys for Tots. They worked very hard to raise money through donations and bake sale to help local children in need.